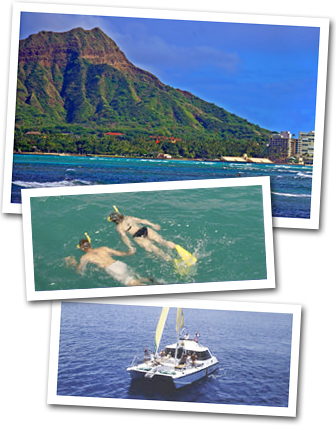 Go Sailing and Snorkeling off Waikiki’s Diamond Head, A Perfect Way to End Your Day on Oahu! Encounter the healing powers of Hawaii’s Pacific Ocean on a relaxing and intimate catamaran sail off the beautiful Diamond Head and Waikiki coastline of Oahu. Hawaii’s 80-degree cobalt and turquoise water becomes a refreshing snorkeling and sailing playground amidst endangered Hawaiian sea turtles, tropical fish, occasional dolphins and seasonal Pacific Humpback whales that frequent this scenic area off Diamond Head. Do as much or as little as you’d like on this catamaran sailing tour off of Waikiki: swim, snorkel, relax and experience the Hawaiian value of “pono” – balance of mind, body and spirit. We recommend you combine this tour with our Downhill Bike Tour or join our full-day Rainforest to Reef Adventure. Experience hidden trails and exclusive guided adventures in Hawaii. From lush rainforests to volcanic coastlines, these exclusive eco-adventures on Oahu feature some of the most incredible places Hawaii has to offer. Whether you’re hiking, kayaking, biking, sailing or snorkeling, your professional nature guides will lead your eco-adventure to remote Oahu that most visitors never see. With exclusive access to private properties, you can be assured you won’t be overcrowded by other tours or public access. You will be provided with Kona mountain bikes, kayaks, snorkel equipment, hiking gear, a 40ft catamaran, transportation from Waikiki and delicious meals and beverages. You are invited to explore Oahu from the rainforest to the reef on any of our multi-sport adventures that can be experienced a-la-carte or all in one day. Combine two or more consecutive adventures in the same day and receive a complimentary deli-style lunch and cold beverages. Includes: The enjoyment of a 40-foot sail catamaran complete with two on-board restrooms, Bose stereo sound system, snorkeling equipment, professional nature guides and return transportation to Waikiki. What to Bring: Swim attire, towel, sunscreen, hat and sunglasses. Don’t forget a camera - the views are amazing! We advise that you only bring what you will need during your adventure with us. A camera or smartphone is ideal to capture images of your day out with us. If not waterproof, it is a good idea to at least have a plastic trash bag from hotel room to protect your camera in case of rain. Please leave purses, computers, credit cards, passports, etc in a safe at your hotel. We are not responsible for damaged, lost or stolen personal belongings while on tour with us. Restrictions: Maximum weight for kayak tour is 250 pounds (114 kilos). All guests entering the water must wear provided life vests know as PFD (Personal Flotation Devices). If you do not know how to swim, please advise the staff before entering the water. Wind plays a big role in how smooth the ocean surface is. We typically operate our ocean trips up to 25 mph winds where you should expect bumpy conditions. We rarely cancel due to wind, but for your comfort and safety, we do not operate during strong or unfavorable wind directions. If we cancel the tour, we will try to move your tour to another day or no charges from our company will apply.